Wastewater chemical sterillization system It is chemical sterillization treatment system of pathgenic bacteria in wastewater. 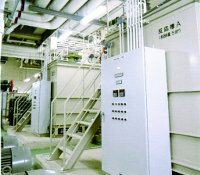 ● Continuous treatment of waste water with pH/ORP sensor and microcomputer. ● Treatment is conducted using NaClO while adjusting pH in reaction tank. ● Long-lasting tank with FRP (Fiber-Reinforced Plastics) which is resistant to rust and corrosion. ● Three treatment methods: Single tank batch method (SR), Double ank batch method (SRW), and Continuous method (SRC).